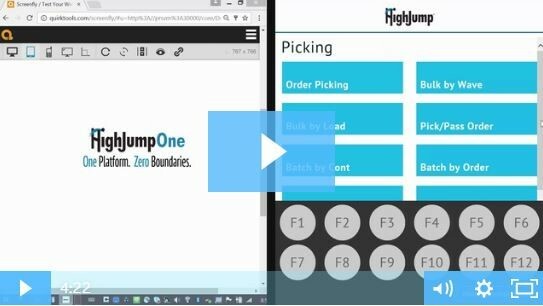 NEW YORK, NY (January 16, 2017) – HighJump, a global provider of supply chain network solutions, announced the release of its new mobile application, HighJump™ Supply Chain Advantage inMotion. The application gives consumer- or commercial-grade smartphones and tablets the capabilities to execute inventory and order fulfillment transactions, lowering operational expenses and ultimately creating a more efficient workforce. HighJump is a global provider of supply chain management software and trading partner network technology that streamlines the flow of inventory and information from supplier to store shelf. We support more than 14,000 customers in 77 countries, ranging from small businesses to global enterprises. Our functionally rich and highly adaptable solutions efficiently manage customers’ warehousing, manufacturing, transportation, distribution, trading partner integration, delivery notes and retail stores. For more information, visit http://www.highjump.com. HighJump is a trademark of HighJump Software Inc., registered in the U.S. and other countries. iWMS is based in South Africa, Americas, United Kingdom and India who, in addition, services the Middle East. This gives iWMS access to the best resources and IT talent globally enabling us to ensure that the right level of experience is available for all projects at any given time. Please contact us if you are looking for a warehouse and supply chain management system service provider for enterprises worldwide.